Día de Muertos (Day of the Dead) is a festive, uniquely Mexican affair that occurs every November. A Mexican resident for over a year now, I had the privilege of taking in this colorful holiday in full last week. Day of the Dead is, as the name implies, a time for remembering the deceased. It actually takes place over two days, not one – November 1st and 2nd. 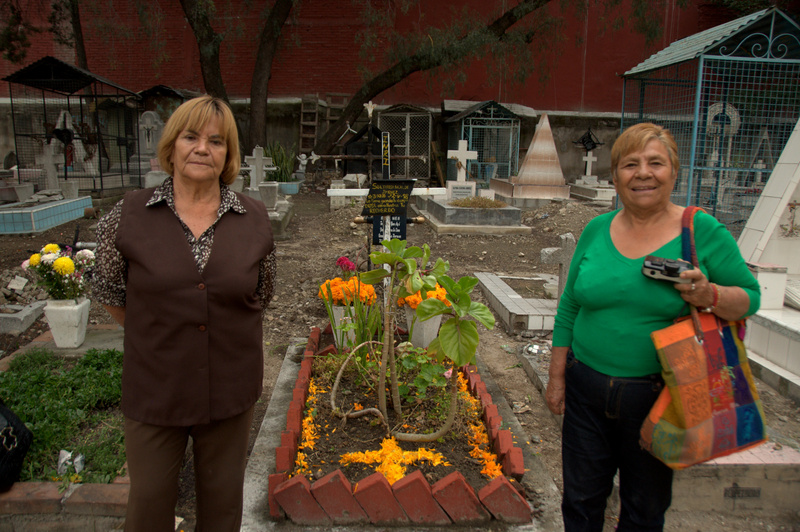 On the first, Mexican families make a pilgrimage to any cemetery housing the buried remains of child relatives who died way too young. 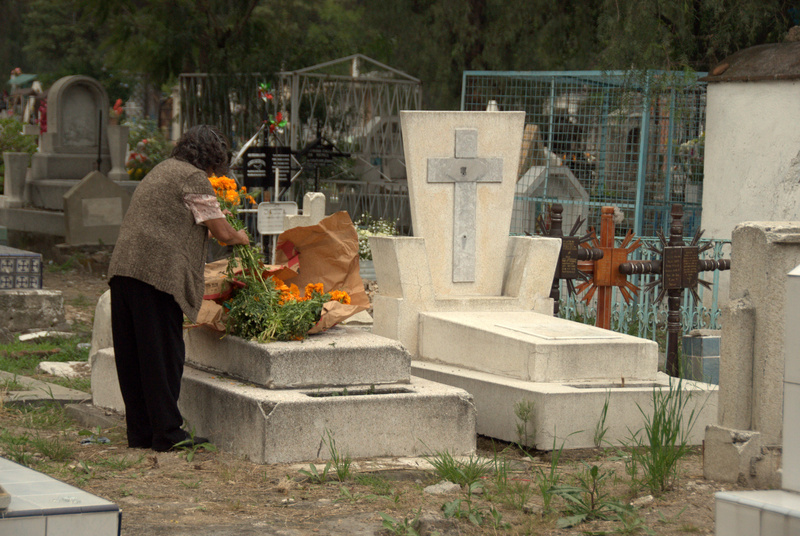 Here, the living relatives tend to the graves, sweeping away dirt and fallen leaves, laying orange flowers in memory and making ofrendas (offerings) – toys, food, or religious trinkets – and spending some hours “visiting” with the dead and toasting their memories. The ritual is repeated on the second, but this time in honor of adults who left this cherished plain for the next world. The previous paragraph comprised my CliffsNotes summary of Día de Muertos, but there is a bit more to the holiday than that. For starters, you don’t have to visit the cemetery to remember your dead. Just leave an offering for them anywhere – on a hearth, below a portrait of them, anywhere basically – and it is said that on “Dead Day” they will visit you. Other Catholic countries observe All Saints Day (November 1st) and All Souls Day (November 2nd), but this being Mexico the holiday is more colorful. Halloween is thrown into the mix as well. Pumpkins, shredded-cotton spiderwebs, and orange candles mark the creepy fall harvest festival in Mexico, same as in the U.S. and other countries that observe this fun holiday. Cardboard skeleton cut-outs adorn many storefront windows, same as anywhere else. Kids (and some adults, including yours truly) dress up in costumes on Halloween, but this is where the differences begin. Halloween costumes in the U.S. become ever more creative with passing years, with people dressing as not just skeletons, ghosts, and witches but also as celebrities, politicians, and even as George Zimmerman and Trayvon Martin! In Mexico, however, costumes are generally simpler, more traditional. Children dress up as Snow White or as their favorite superheroes – I saw half-a-dozen Spider-Men and a couple of very convincing Batmen, but adults usually dress up simply as the traditional witch, werewolf, or vampire. Often, adult costumes are limited to masks – I wore a monster mask and went to a Halloween party where two partygoers wore matching Catwoman masks and ears. In the U.S. it’s common to dress up as Barack Obama or Mitt Romney; in Mexico there was nary an Enrique Peña Nieto mask to be found. Perhaps the most elaborate costume I saw was that worn by a young woman who dressed up as Frida Kahlo – unibrow and all – and I did see a dachshund dressed up in a skeleton costume…. 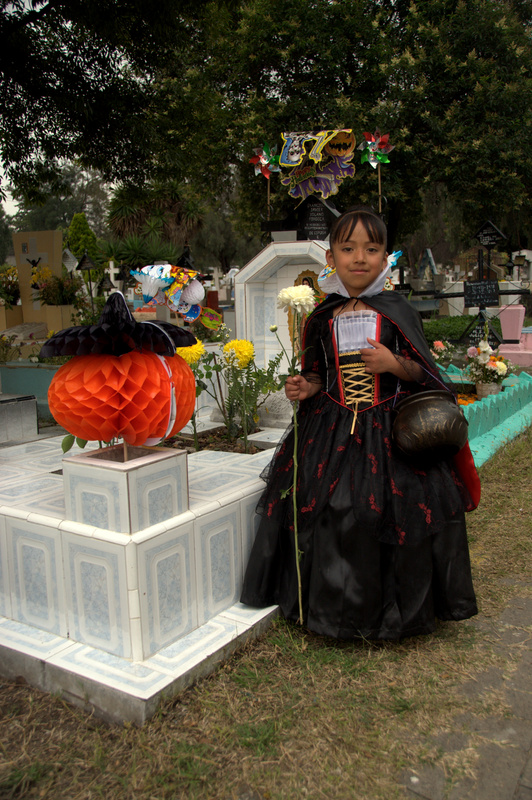 Trick-or-treating takes place over one of any three days in Mexico. Halloween proper, of course, but also on November 1st and 2nd. I hopped on the metro on Sunday, November 2nd and the children of the usual vendors that set up camp in my neighborhood station were all dressed up full costume and pumpkin-shaped trick-or-treat buckets. Candy-wise, I’d say those kids hit the mother lode! I decided to take in as much of the holiday as I could. I had a class to teach on Friday morning, November 1st, and the class was interrupted by a 9 a.m. serving of pan de muerto, which literally means “dead bread.” This sugary baked pastry, an annual Día de Muertos tradition, is basically a kaiser roll smothered in sugar and topped with criss-crossing strips of bread that resemble skeletal bones. Delicious! 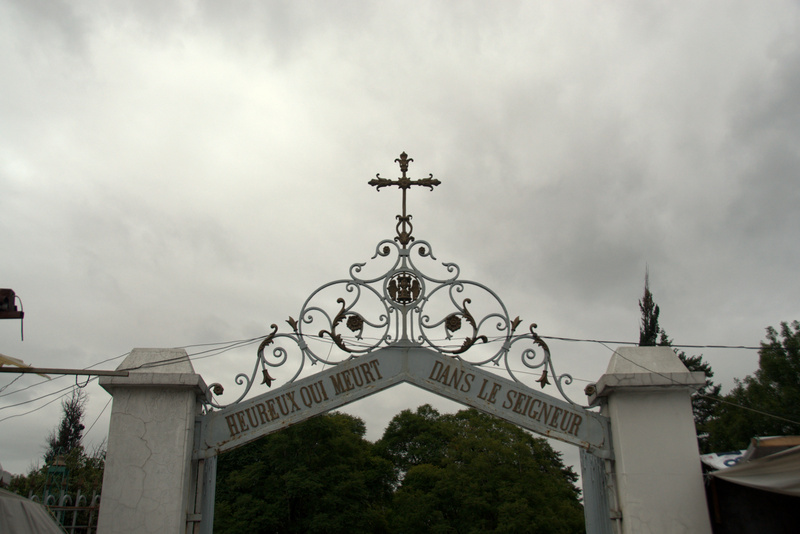 Later that day, I visited a peasant cemetery, Panteón Sanctorum, in the north of the city. 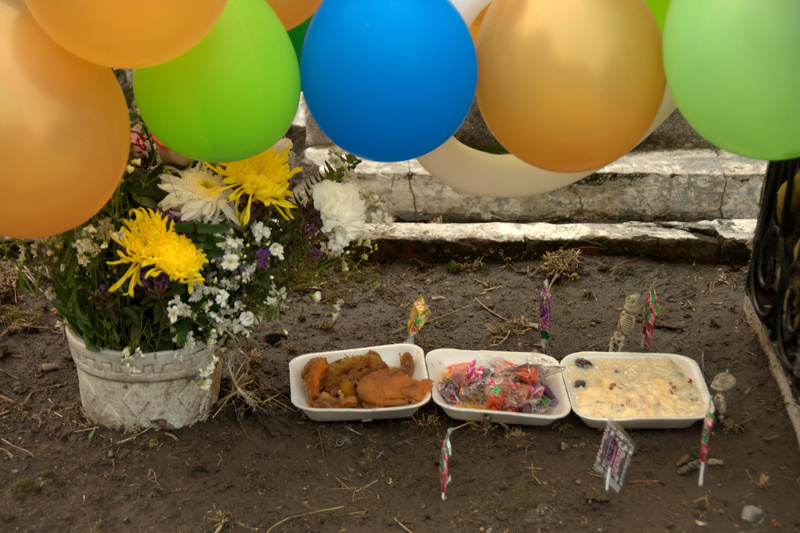 The entry gates were surrounded by flower vendors and pan de muerto sellers, and the cemetery was absolutely bustling with families that had come from miles around to make offerings to loved ones – children. Panteón Sanctorum is gigantic, and is situated in an unsafe neighborhood. 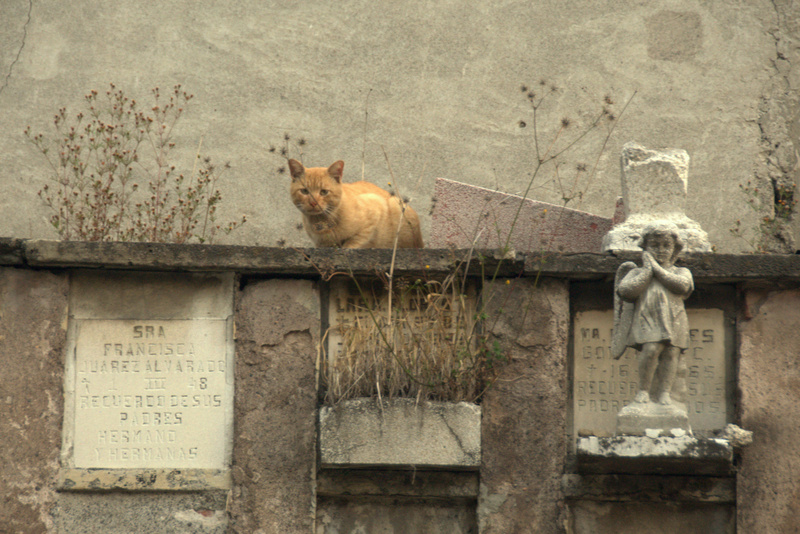 The cemetery – like the neighborhood around it – has seen better days. A few graves were well-kept but many were crumbling. For a photographer like me, this was like a dream. I snapped away at spider-webbed tombs and leaf-covered sidewalks. When I saw families gathered around I was cautious; I sooo wanted to photograph them but to do so seemed obtrusive. I snapped a few pics from a distance, I must confess, but mostly I just watched. I couldn’t believe what I saw. I predicted a somber event with grieving mothers, straight-faced fathers, and veiled grandmothers. Instead, families were having all-out parties! Soda, beer, baked goods and salty snacks appeared to be consumed con gusto, and I didn’t see a sad face in the lot. Twice that day I saw mariachis performing; each time their only spectator was a lone man – presumably the father of the perished child buried herein – and while I couldn’t quite read the men’s expressions from where I was silently watching, I wouldn’t be surprised if they were smiling, not crying. If it was me, standing over the grave of my deceased child (or grandchild, or niece or nephew), I don’t think I could hold up. In time, a few locals approached me and asked if I could take pictures of them with their cameras. I agreed, under the condition that I could shoot them with my own camera as well (I even offered to email the images to them). They agreed. I photographed a young girl in full Evil-Queen-from-Snow-White garb; then a large family including three hyper children; then two older women who I presume were sisters. I enjoyed a pleasant “Spanglish” chat with these ladies until they advised me to clear out well before nightfall, as “ratitas” (rats – human and animal both) come out to hunt. Yikes! I ultimately spent several hours at Panteón Sanctorum, and came to the conclusion that Día de Muertos is a celebration of life, not a mourning of death. After countless visits to Mexico and a full year residing here, I finally understood so much about why Mexico is – and will always be – a second-world country, at least as regards safety. I finally understood why so many Mexicans don’t wear seatbelts when riding in cars, don’t use turn signals when driving, and continue piling more-and-more passengers onto dangerously-overcrowded buses. I can’t say that I agree with this philosophy myself, but it seems that to most Mexicans, death is not something to fear. Death is merely the next stage in life. 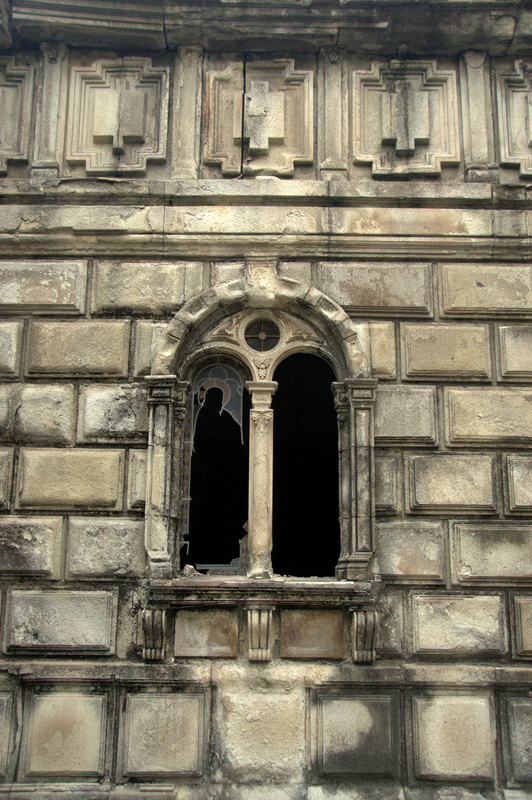 The next day I visited Panteón Francés, a cemetery for the wealthy, built by the French during Mexico’s colonial period. 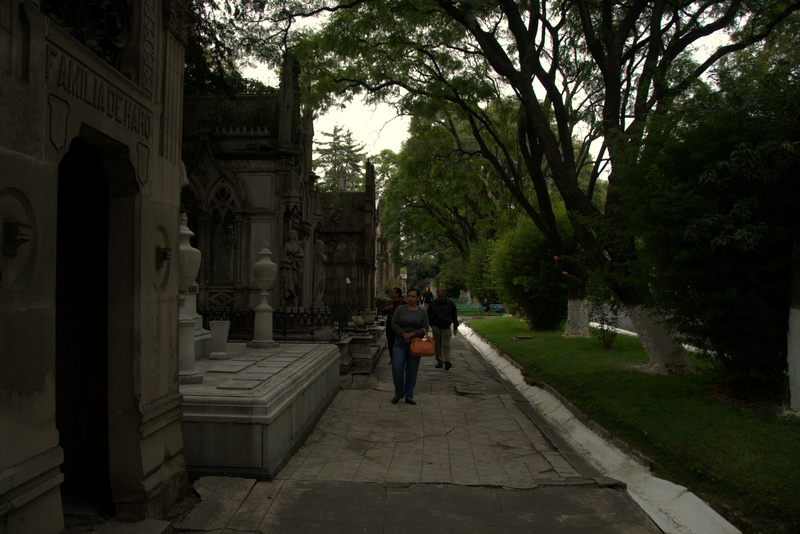 The cemetery was astonishingly beautiful, with tree-lined pathways meandering alongside gorgeous marble mausoleums. 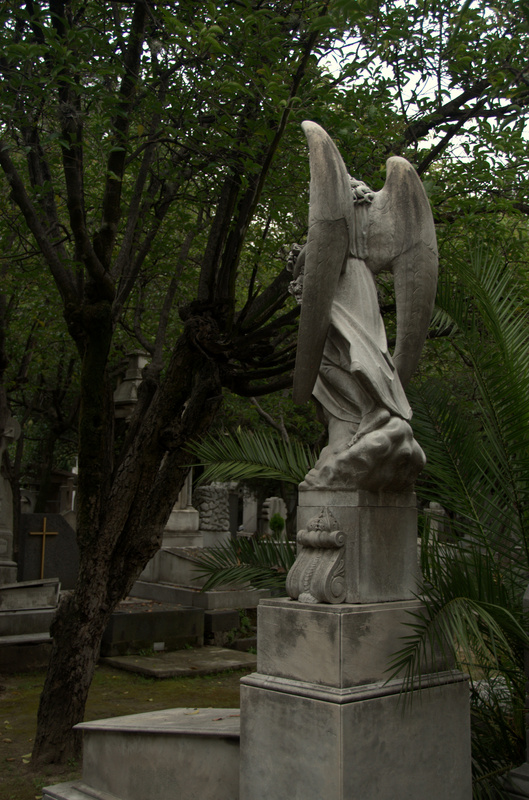 I was immediately reminded of Montparnasse Cemetery in Paris. I arrived at 3 p.m. and stayed until the place closed at six. 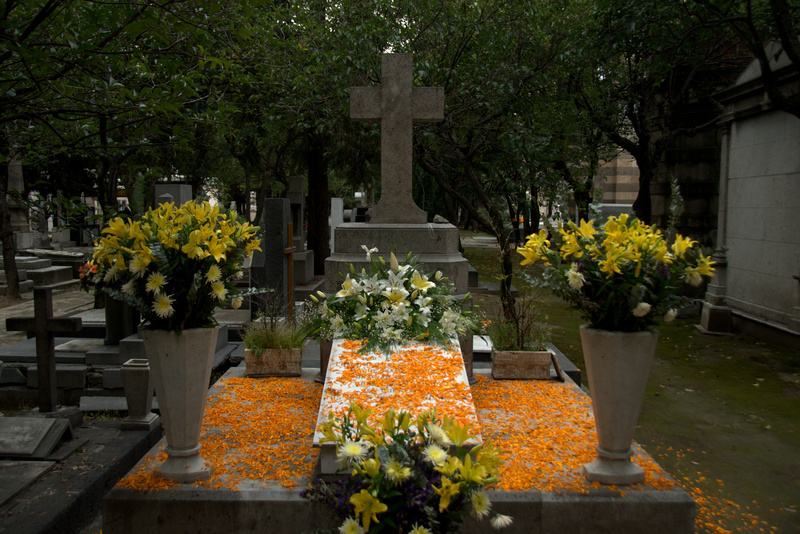 I came across several lovely ofrendas, almost all in the form of orange flowers. I observed one large family gathered for what seemed like quite the festive celebration of life; the children were dressed in costumes while the loudest mariachi band I’ve ever heard was singing with such gusto that you could almost certainly hear them beyond the cemetery walls. I saw just two other families at Panteón Francés. Although they were tidying up the areas around their loved ones’ tombs with almost fanatical precision, I never saw the bustle of activity I observed at Panteón Sanctorum just one day prior. Panteón Francés remains one of the most hauntingly picturesque cemeteries I’ve seen anywhere, but I was surprised to find that my visit to Panteón Sanctorum was infinitely more interesting. My culture-filled weekend had one more day of surprises. The week before, one of my students suggested that I visit the UNAM (Universidad Nacional Autónoma de México) campus in the south of the city, where supposedly several ofrendas were being displayed on the main lawn. 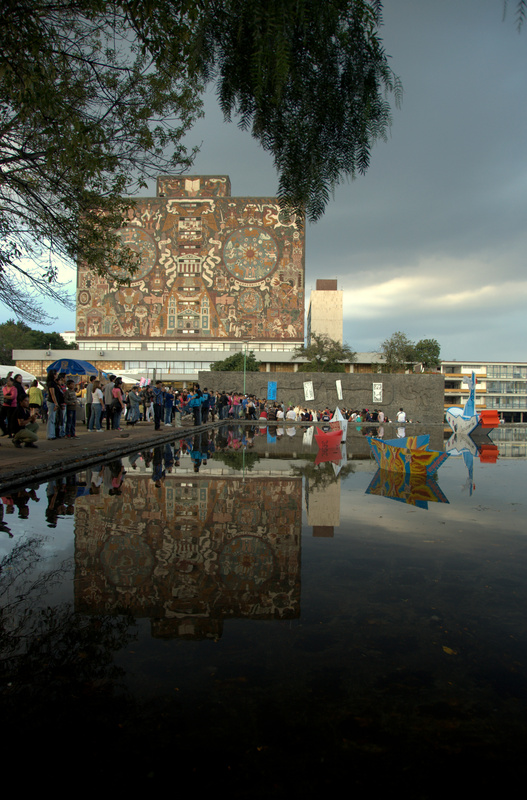 With research I learned that each year UNAM’s “mega-ofrenda” is dedicated to a particular figure in Mexican culture. The 2013 honoree was Remedios Varo, a Spanish-born Mexican surrealist painter who was most prolific in the mid-20th century. I am not especially familiar with her work, but it seems that the individual ofrendas were Día de Muertos-inspired “reenactments” of her most famous pieces. 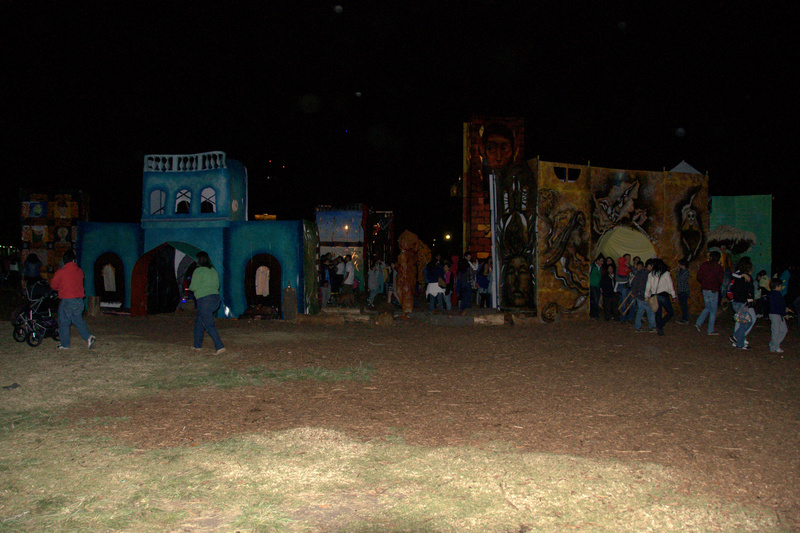 The UNAM mega-ofrenda was an awesome affair. The university has an annual enrollment of 350,000 students; this should give you an idea of the size of the main lawn. Nearly every square meter was filled – with ofrendas, food stalls, bandshells, and locals taking in the spectacle. I saw three musical performances on three separate stages – a contemporary Mexican rock band, an African dance troupe, and (somewhat out of sync with the general theme) a Christmas choral ensemble. I visited every ofrenda – a castle and a labyrinth among them – and I made sure to have my picture taken with La Calavera Catrina, an elegant female skeleton and an omnipresent Día de Muertos character. The evening was capped off with tamales from one of the food stalls and some successful night photography (a few such pics are presented below). This blogger and humble (?) 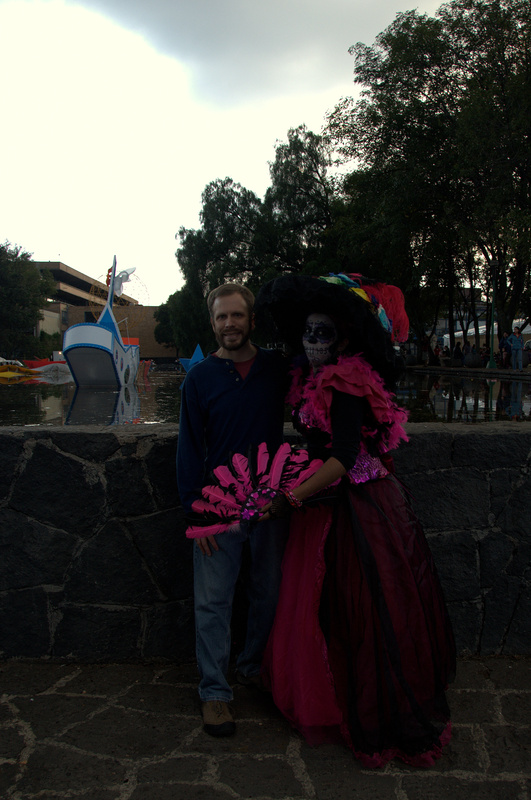 gringo was floored by Day of the Dead festivities in Mexico City. What I foresaw as a solemn memorial to loved ones passed was, in actuality, a spirited tribute to their lives and their memories, and a reminder that even though you only live once, you’ll always live on in the memories of those you leave behind. 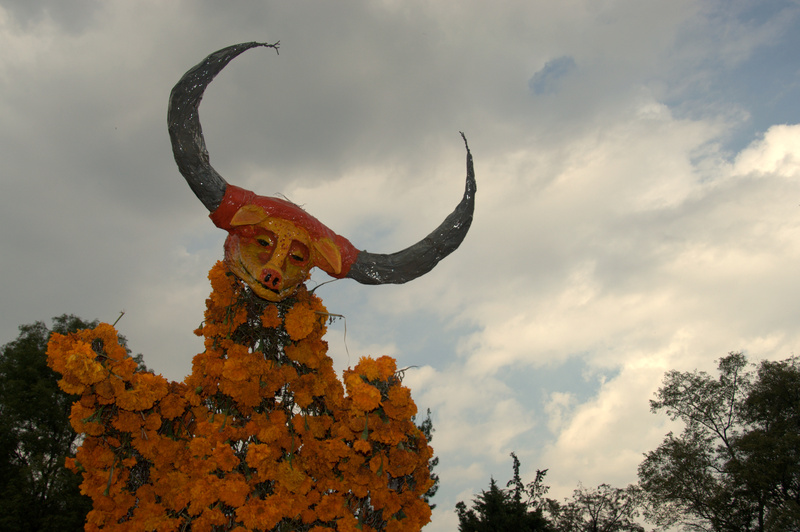 I read last night that the most spiritual Día de Muertos “celebrations” take place in Michoacán State. Here, the shores of Lago de Pátzcuaro are home to the Purépecha people, descendants of the Tarascos, a pre-Colombian civilization about which very little is known. Every November 1st, the Purépecha launch a fleet of elaborately-decorated canoes from the shores of the lake’s Isla Janitzio. 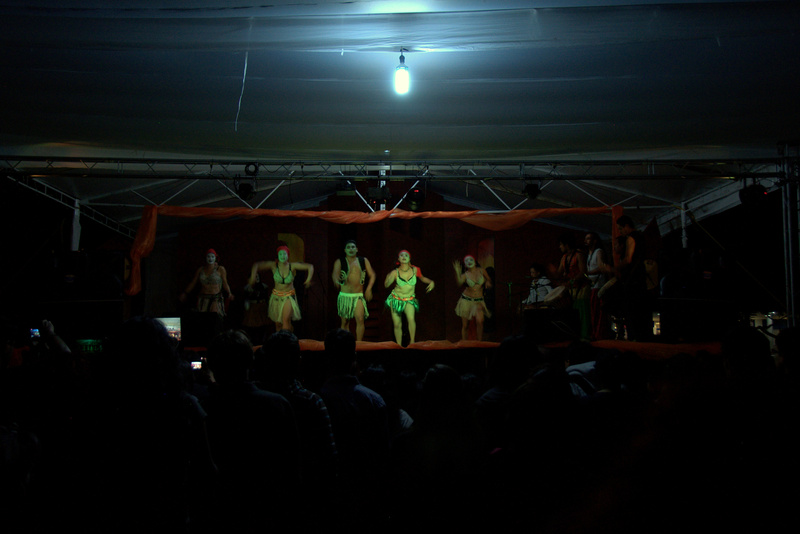 This launching is the culmination of a full day’s worth of singing, dancing, and general merriment taking place not just on Isla Janitizio but in the surrounding villages as well. I think I know where I’ll be next Day of the Dead. I snapped hundreds of pics over those three days. Here are just a few. I will be adding a larger album to Facebook if you are curious to see more. If you’re still down there next year I just may join you on the trek to the lake in Michoacan. Ever since I read about it it’s been on my bucket list. Great, it’s always nice to have company for excursions such as that. Really enjoyed this one Snakessss…. There is always something really interesting about observing a deeply personal and family oriented event like this as an ex-pat, or even a tourist. It makes me think how it would be to “observe” Thanksgiving – for example as a tourist to the US. That said, I think in most cultures except our own, it’s more common to embrace the public space; the parks, the city itself for celebrations. So seems like you captured that in this post quite well. I enjoyed reading this! Thanks for sharing. I like reading about your experience and perspective. Just one thing, I don’t mean to be annoying but pan de muerto literally translates to bread of the dead, instead of dead bread. 🙂 Actually, it literally, literally would translate to bread of dead, but that’s kind of weird hehe.